I am using XAMPP for development. Recently I upgraded my installation of xampp from an old version to 1.7.3. Everyone suggest using some specific curl options from PHP code to fix this problem. I think this shouldn't be the way. Because I didn't have any problem with my old version of XAMPP and happened only after installing the new version. I need help to figure out what settings change in my PHP installation, Apache etc can fix this problem. curl used to include a list of accepted CAs, but no longer bundles ANY CA certs. So by default it'll reject all SSL certificates as unverifiable. You'll have to get your CA's cert and point curl at it. More details at cURLS's Details on Server SSL Certificates. It's a pretty common problem in Windows. You need just to set cacert.pem to curl.cainfo. download https://curl.haxx.se/ca/cacert.pem and save it somewhere. update php.ini -- add curl.cainfo = "PATH_TO/cacert.pem"
Warning: this can introduce security issues that SSL is designed to protect against, rendering your entire codebase insecure. It goes against every recommended practice. I believe that this disables all verification of SSL certificates. I will explain why the error and what you should do about it. The easiest way of getting rid of the error would be adding the following two lines to your script . This solution poses a security risk tho. Let see what this two parameters do. Quoting the manual. CURLOPT_SSL_VERIFYHOST: 1 to check the existence of a common name in the SSL peer certificate. 2 to check the existence of a common name and also verify that it matches the hostname provided. CURLOPT_SSL_VERIFYPEER: FALSE to stop CURL from verifying the peer's certificate. Alternate certificates to verify against can be specified with the CURLOPT_CAINFO option or a certificate directory can be specified with the CURLOPT_CAPATH option. CURLOPT_SSL_VERIFYHOST may also need to be TRUE or FALSE if CURLOPT_SSL_VERIFYPEER is disabled (it defaults to 2). Setting CURLOPT_SSL_VERIFYHOST to 2 (This is the default value) will garantee that the certificate being presented to you have a 'common name' matching the URN you are using to access the remote resource. This is a healthy check but it doesn't guarantee your program is not being decieved. Well, we need to to verify the certificate being presented to us is good for real. We do this by comparing it against a certificate we reasonable* trust. Save the file cacert.pem somewhere in your server and set the following options in your script. The above solutions are great, but if you're using WampServer you might find setting the curl.cainfo variable in php.ini doesn't work. The first is apparently used for when PHP files are invoked through a web browser, while the second is used when a command is invoked through the command line or shell_exec(). If using WampServer, you must add the curl.cainfo line to both php.ini files. Sometimes if the application you try to contact has self signed certificates, the normal cacert.pem from http://curl.haxx.se/ca/cacert.pem does not solve the problem. In my case, I had to set the openssl.cafile PHP config variable to the PEM file path. I trust it is very true that there are many systems where setting curl.cainfo in PHP's config is exactly what is needed, but in the environment I'm working with, which is the eboraas/laravel docker container, which uses Debian 8 (jessie) and PHP 5.6, setting that variable did not do the trick. I noticed that the output of php -i did not mention anything about that particular config setting, but it did have a few lines about openssl. There is both an openssl.capath and openssl.cafile option, but just setting the second one allowed curl via PHP to finally be okay with HTTPS URLs. I have the same error on amazon AMI linux. I ended up here when trying to get GuzzleHttp (php+apache on Mac) to get a page from www.googleapis.com. Here was my final solution in case it helps anyone. Note: I captured this after I fixed the issue, to your chain output may look different. Then you need to look at the certificates allowed in php. Run phpinfo() in a page. This is the file you'll need to fix by adding the correct certificate(s) to it. 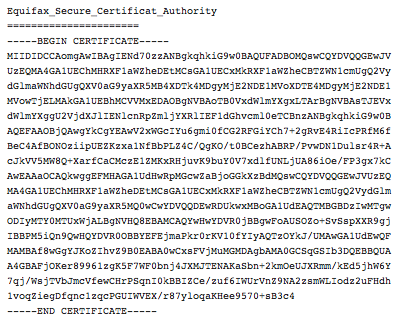 You basically need to append the correct certificate "signatures" to the end of this file. You can find some of them here: You may need to google/search for others in the chain if you need them. Once the right certificates are in this file, restart apache and test. You could try to reinstall the ca-certificates package, or explicitly allow the certificate in question as described here. Not the answer you're looking for? Browse other questions tagged php ssl curl openssl ca or ask your own question.